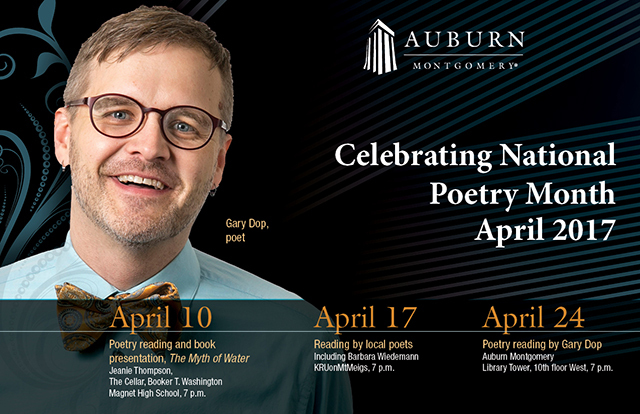 7 p.m. | April 17 | KRUonMtMeigs | If you are interested in reading your poetry, contact Dr. Michel Aaij at maaij1@aum.edu. Gary Dop — poet, performer, and playwright — lives in Virginia, where he teaches at Randolph College. Dop’s poems, according to the North American Review, “effortlessly share the space of authentic humor and seriousness.” He writes about people, family, and humanity’s bumbling effort to connect with others. His poems are regularly published in magazines throughout the country, including Prairie Schooner, Rattle, Blackbird, New Letters, and North American Review. For information, contact Dr. Aaij at maaij1@aum.edu.